According to the flat earth map New Zealand and Argentina, for example, are on opposite sides almost 20,000 miles apart. So flat earthers claim it is not possible to fly between such locations in the 11 hours that a number of airlines offer flights doing. A plane would have to travel at more than twice the speed of sound to make the journey in 11 hours on a flat earth. So flat earthers claim such flights are impossible and airlines who advertise such flights are part of the globe earth conspiracy and in reality these flights do not exist. This is totally incorrect. To prove it for myself recently I flew from New Zealand to Argentina and back again with Air New Zealand. I took my iPhone and logged all the sensor data from the iPhone including altitude, compass direction, heading, speed, GPS coordinates, etc. I have those logs for both flights. Both flights took about 11 hours so these flights are certainly real and possible and this proves the map the flat earthers currently accept can not be correct. I will post more details of my flights and an analysis of the data logged by my iPhone during them in another post. Conclusion: Flat earthers are incorrect on this point. Flights between locations in the south are possible within the expected times predicted on a globe earth. This proves the currently accepted flat earth map is incorrect. It does not prove the earth is a globe but it is consistent with what we would expect on a globe and totally impossible on the flat earth map. 43) If Earth was a ball there are several flights in the Southern hemisphere which would have their quickest, straightest path over the Antarctic continent such as Santiago, Chile to Sydney, Australia. Instead of taking the shortest, quickest route in a straight line over Antarctica, all such flights detour all manner of directions away from Antarctica instead claiming the temperatures too cold for airplane travel! 44) If Earth was a ball, and Antarctica was too cold to fly over, the only logical way to fly from Sydney to Santiago would be a straight shot over the Pacific staying in the Southern hemisphere the entire way. Re-fueling could be done in New Zealand or other Southern hemisphere destinations along the way if absolutely necessary. In actual fact, however, Santiago-Sydney flights go into the Northern hemisphere making stop-overs at LAX and other North American airports before continuing back down to the Southern hemisphere. 46) On a ball-Earth Cape Town, South Africa to Buenos Aries, Argentina should be a straight shot over the Atlantic following the same line of latitude across, but instead every flight goes to connecting locations in the Northern hemisphere first, stopping over anywhere from London to Turkey to Dubai. 47) On a ball-Earth Johannesburg, South Africa to Sao Paolo, Brazil should be a quick straight shot along the 25th Southern latitude, but instead nearly every flight makes a re-fueling stop at the 50th degree North latitude in London first! There are no flights to and from Johannesburg – Santiago. They would not be enough passengers to make it pay. You have to go by roots that that make a profit. London Jo,burg and London Santiago are in demand roots. Durrrrrrrrrrrr! You are correct of course. 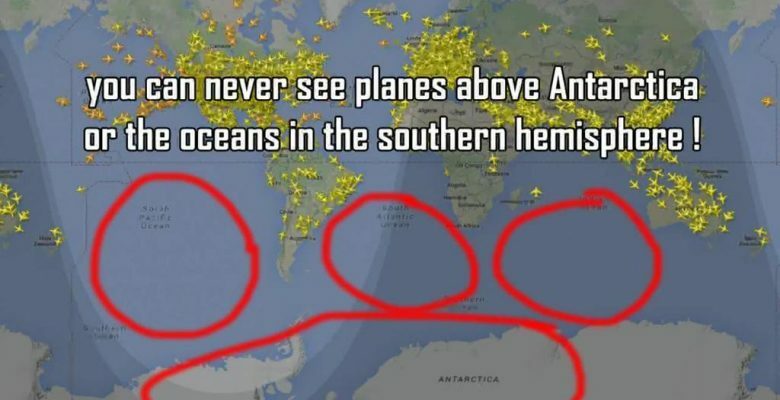 Southern Hemisphere is mostly ocean. It has South America, South Africa and Australia and New Zealand and only a few other very small islands. The airline routes are all about logistics. Airlines fly from a hub. Like British Airways fly from London. If you want to fly from Paris to Amsterdam by British Airways they are likely to fly you to London first and then on to your final destination. This makes sense for the airlines because they fly all their passengers to their hub and then take all the passengers from there to their final destinations. That way they bring the people from all over the world to one place and can then send full plane loads of people out from that place all over the world. It is just the way airlines work and why sometimes flights do not make sense or seem to be very direct. There is at least one of these Southern Hemisphere flights in operation. Air New Zealand fly from Auckland to Buenos Aires in Argentina. On the flat earth map this would have to be very, very long flight. But they fly it in about 12 hours. The flight is most certainly real and it does certainly fly from New Zealand to Argentina in 12 hours. I have flown the route twice, a return trip. What I have written on that page about the route as plotted on google maps from the coordinates from my iPhone may be wrong because I just looked at the raw data and I have got GPS coordinates down to latitudes of -50 degrees. So Buenos Aires is at about -34.5 degrees, so it seems the plane has gone down towards the South Pole 15.5 degrees and then back up to Auckland which is at almost -37 degrees. So I do not know why the plot on google maps did not show this. I will have to check it out again. did you be awake in both flight? if so, did you notice an unusual sudden jerk in airplane movement? can somebody flight with his personal jet at these airways? Yes. I was awake all the time in both directions and there was no sudden jerk in the flights. I have all the iphone logs, GPS was not working on the flight to South America, it was partially working on the flight back, but iphone has a compass and altimeter in it so it logs the direction the plane is heading [according to its compass and according to its GPS]. So I have not looked at these data logs in great detail but it seems to me the compass directions did not make sense in my first glance. But I am not actually sure iphone compass would work properly in a plane anyhow. How do you know they were taking advantage of a so called great circle phenomenon of a “globe earth” as apposed to a faster air current when you had no way to tell if you were being told the truth about the air speed of the aircraft?